I'm not much of an online shopper. I have long legs and a short torso and questionably long arms, so I'm always hesitant to shop online in fear of it showing up being more size appropriate for a 12 year old. I'd prefer to set aside a few hours and go to the mall where I can see the pieces, touch the fabrics, and most importantly, try them on! That is until I discovered the Frank + Oak Style Plan. I'm sure you've seen the subscription boxes of nearly every variety floating around the Internet. There are boxes for your dog, your cat, your kid, boxes for snacks, make-up, fitness accessories - you name it and there is likely a box for it! I've never been intrigued by that type of service, but (there's always a but!) when Frank and Oak told me about their Style Plan, which is a subscription service for clothes, I was sold. This goes against my hesitation towards online shopping but it's worth embracing the hesitation and giving this a go! For $89 a month you can receive up to 4 pieces right to your doorstep! You can choose a monthly or bi-monthly plan, log-in, choose your pieces and ta-da! Sounds like a pretty sweet deal if you ask me. For a limited time, when you use my referral link, you can save $30 on your first month. So that's up to 4 pieces of clothing for $59! How does that saying go - you never know unless you try it? Well, I tried it and I am one happy gal! 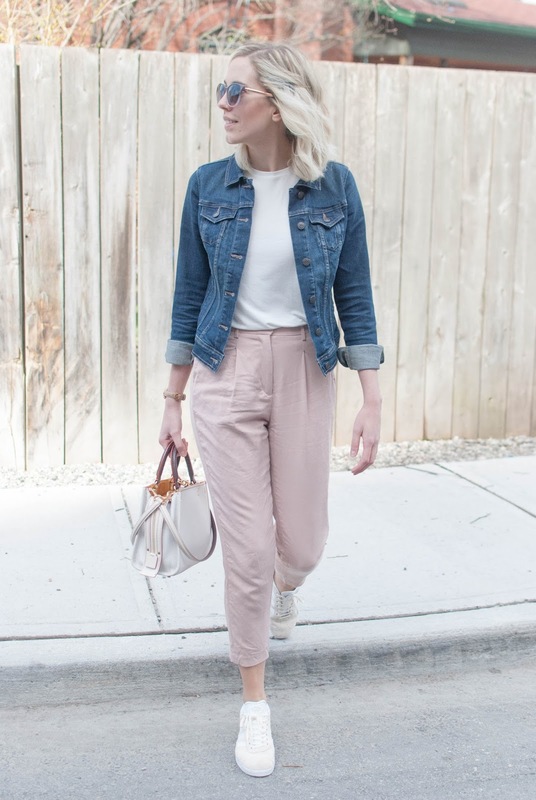 I picked these dusty rose high waisted pants. I was hesitant to order pants as per the aforementioned everything-is-always-capris-on-my-long-legs issue. Of course, these arrived and I could wear them to the flood waters and stay dry, but I actually really love them cropped! They're really light weight which is great as we head into warmer temps, and the dusty rose is a new favourite colour of mine. I'm slowly but surely incorporating more shades of pink into my wardrobe! I also picked the soft cream coloured muscle tank under my denim jacket. When I say soft, I mean really soft. I'm sure it will be a staple in my rotation of tops this summer! Like most of my wardrobe, I appreciate the pieces that can be dressed up and worn casually. My Adidas Gazelle sneakers have been sitting on my shelf since Christmas, patiently waiting to be worn! These pants would also look great with a pair of heels and a leather jacket for a night out or a fancy brunch. Maybe this will be the beginning of my love affair with online shopping (sorry, Andrew!) With size charts and a no-fuss return policy, who knows, your next package on your doorstep may contain one of your favourite pieces yet! This post was brought to you in partnership with Frank + Oak. All opinions are my own.